Dealers for the purchases made on interstate basis from 01/04/2014 to 01/06/2014 may issue “C” Forms for the said purchases, treating the said period as one quarter, as there is no stipulation that only one “C” Form has to be issued for all the purchases from a single seller during a quarter. What all CST Rules stipulate is a single “C” Form may cover purchases made in a quarter. For CST purchases of goods from 02/06/2014 to 30/06/2014, separate “C” Forms may be issued. 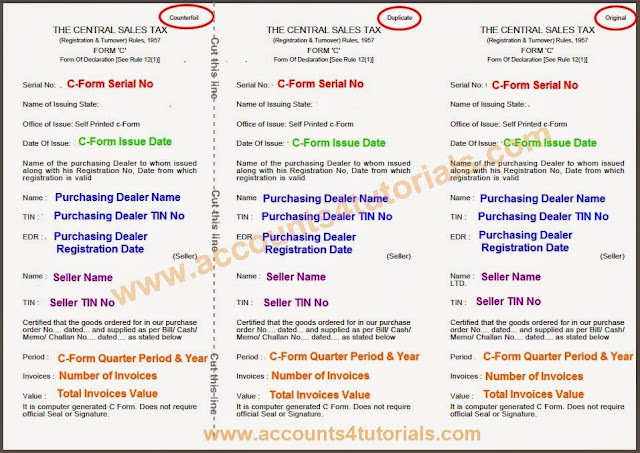 “C” Forms not obtained as on 02/06/2014 for the earlier transactions. Whether to be obtained with new TIN or old TIN and from whom? They have to quote the old TIN and request “C” Forms from the concerned assessing authority under whose jurisdiction, they come on or after 02/06/2014. Steps are being taken to issue new “C” Forms and other statutory Forms for the State of Telangana for the transactions on or after 02/06/2014. Note: TIN No Must start with "36"
> From the e-WAYBILLS/C FORMS Tab, Click on "CREATE E WAYBILL/C FORMS"
> From Dealer Profile Table, Select "C Form" radio button. Note: Year Must be ON or AFTER 2014. 9.Select State, which is seller state. 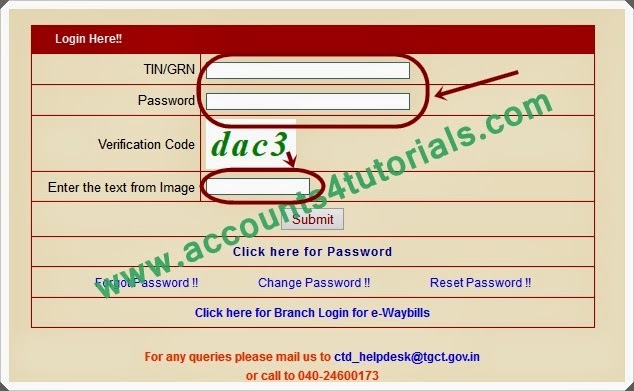 "If required commodity is not appearing in list, please approach CTO to add commodity to CST Registration database". 13.Select 'UOM' from the list. > After enter the all details, click on "Add Invoice"
> If Invoice uploaded successfully, it shows successful message. > Now you can see following screen. 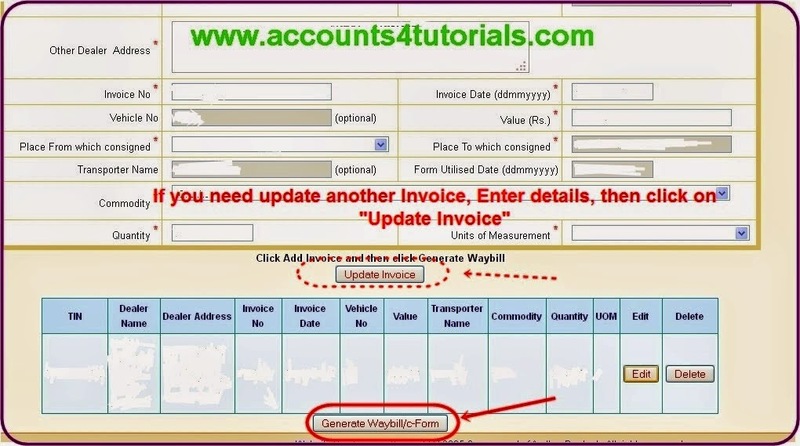 > If you update another invoice just re-enter the Invoice Details, then click on "Update Invoice"> After uploaded completed, Just verify all Details, then click on "Generate Waybill/c-Form"
From the 'e-WAYBILLS/C FORMS' Tab, Click on "REPRINT FORM"
> Just Sign and Put Company Seal on Bottom of the Form. 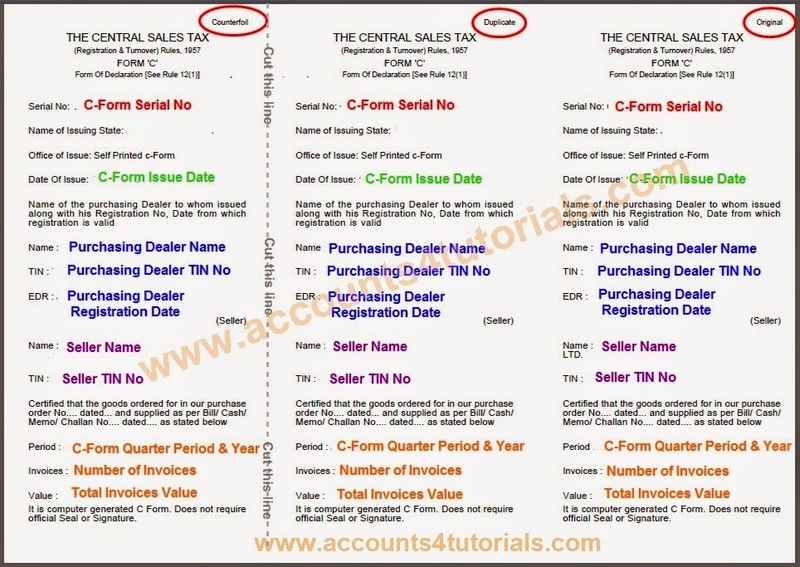 > File "Counterfoil" in your C-Forms File and Remaining (Duplicate & Original) Forms issue to Seller/Supplier. Vehicle number field is compulsory. As it comes in transport we don't have the vehicle number. What to key there ? I have more than 5 invoices . can i generate 2 C forms for 1 quarter. Thank u for ur comment. You can generate more than one C-Form for one quarter for one supplier. 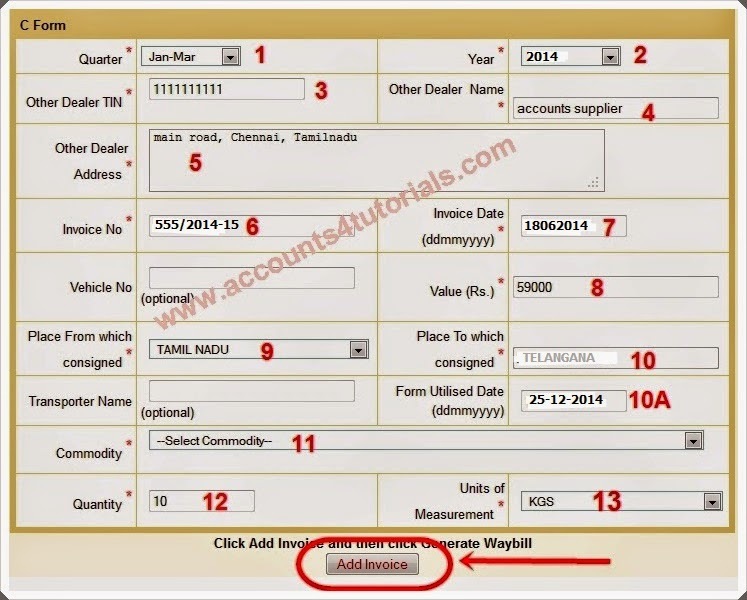 when i click on "create e waybill/C, F form" I don't get any options under the dealer profile to select. Help, please. send screen shot to our mail ID vasu8121526726.india@gmail.com. we will solve your problem. Issue C-Form on Taxable value + Tax Amount. Thanks for your clarity explanation. Yes, Signature and Stamp is mandatory. Put your company/firm seal and signature on bottom of C/F/H form.